Well Halloween is almost upon us, so this week we at FAN_TASTIC Challenges are asking to see a Halloween project. 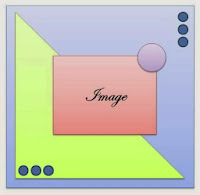 You may know we started this challenge for Fat Pages 4 inch square works of art, our logo being It's Hip To Be Square'. After a lot of discussion and and suggestions the group have decided to go SQUARE. but it can be any size. 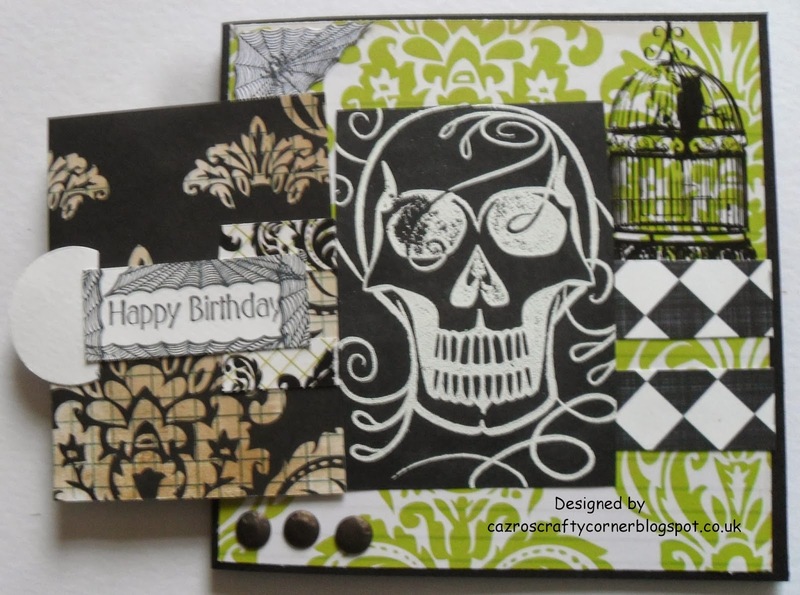 it doesn't have to be a card, but whatever project you make it must be square and fit in with the required theme. So here is my 5 inch square card, based on black card, then orange then mirri card. The main image is white card stamped with the witch and ghouls parade from Tandastamps, sadly no longer in business. I coloured the background with 3 shades of blue Distress Inks. There is some glitter in the moon and across the parade but not sure if this will show. I look forward to seeing your entries into our challenge and hope you find the new rules as exciting as we feel they are. If your celebrating Halloween have a good night and hopefully get lots of treats and very few tricks. I shall be busy all night, I've got my Nimbus 45 out of the cupboard and we shall be flying the night sky to our secret place for a witches and warlocks Supper, Spells and Dance night. Winter Wonderland this week are asking us to Check it Out, pop over to see what their challenge is. You can probably work it out looking at my card. The check paper is from Forever Friends Christmas paper pad. 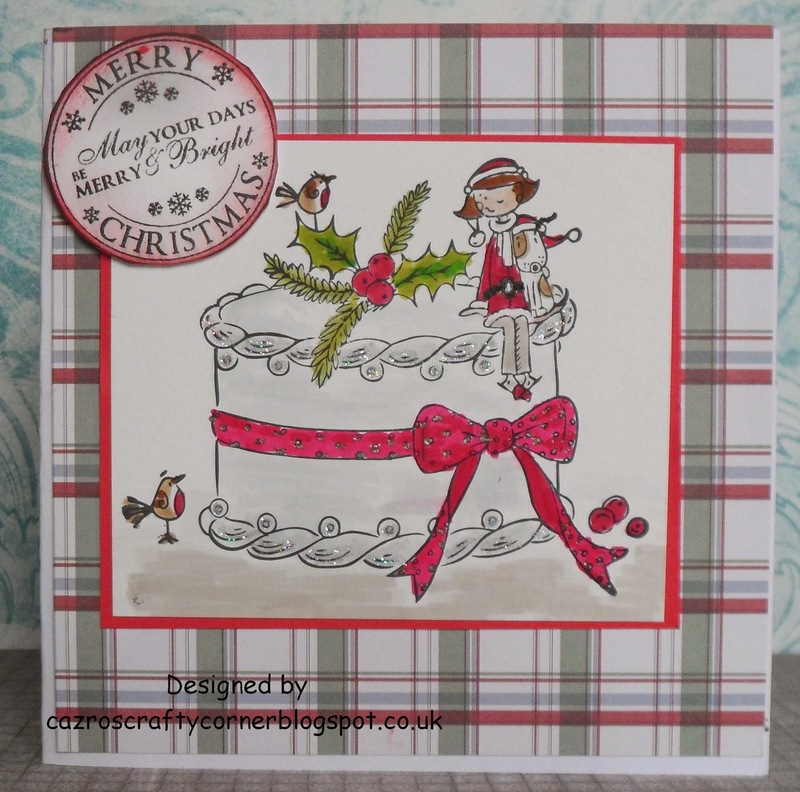 The Christmas cake image coloured with Promarkers is from Papermania, Tulip designs. Thanks for popping by. This week at CD Sunday Challenges, Christine has given us an exciting opportunity to Travel Abroad. A country I would so like to visit is Italy, in particular Venice. I know, unless Mr. Lottery is good to me, this is not going to happen, so instead I will indulge in fantasies. Thank goodness for these opportunities when card making. I have made the 8 inch sq card using a collage page and image from Debbie Moore Shabby Chic Travel CD. The lady is also from Debbie Moore but from the Art Deco Glamour DVD. I have added a butterfly, pink and silver glitter here and there. I look forward to my week ahead of travelling abroad, I wonder how many countries I shall visit. Have fun everyone. NB. On a private note, as October is Breast Cancer Awareness month, I am hoping to find other challenges to enter this card, so if anyone knows of appropriate challenges for me to spread the word by making a pink, feminine card I would appreciate you suggesting it in your comments- to help me spread awareness. Thank you for your help. SCARY . Here I used a black card. 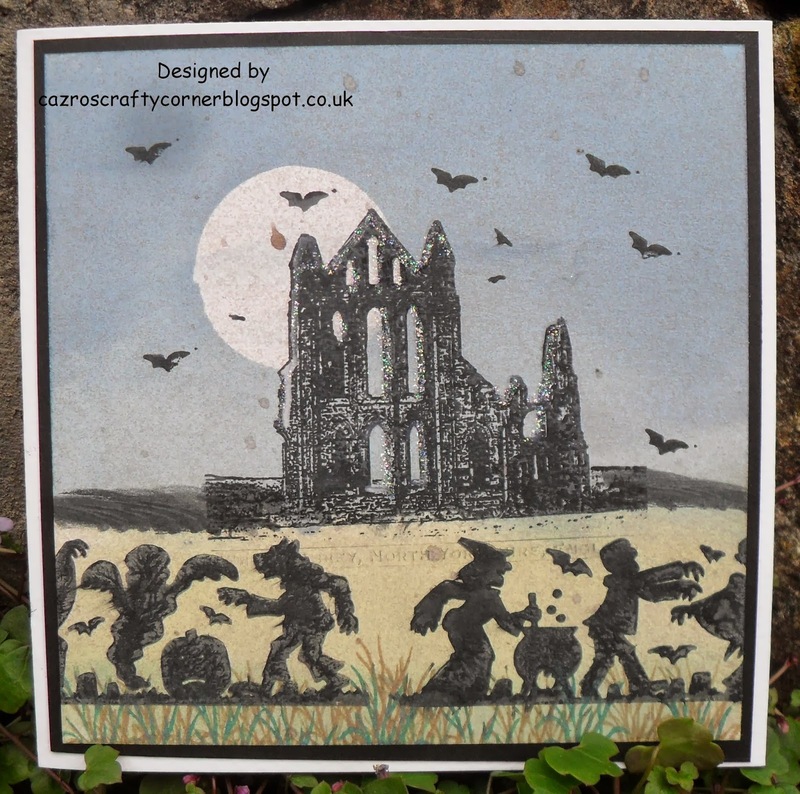 The main image has been created, first by colouring the sky and the ground, using Distress Inks, an image of Whitby Abbey, from Crafty Individuals, the ghouls long stamp was from Tandastamps, sadly no longer in business. A light spray appropriately of Desert Moon Horny Toad Teal. I wish all the Halloween enthusiasts a Spooky - Scary time and for everyone else please just ignore we ghouls, but have fun making a project for our Scary theme. At Winter Wonderland challenges this week the theme is Carol Singers. I had just completed a card which is perfect for the challenge. I have tried something different. They do say in the craft TV world that Kraft card is becoming more popular, maybe so, but sadly I don't see much of it on the different challenges I visit and favour. So here is my offering. 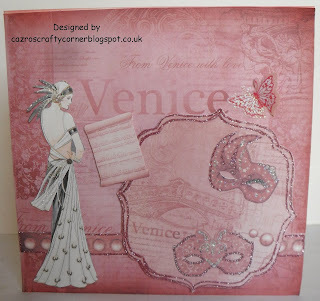 I did buy at Doncaster show a LOTV Kraft patterned paper pad so need to use it. I edged the papers with Vintage Photo Distress Ink. 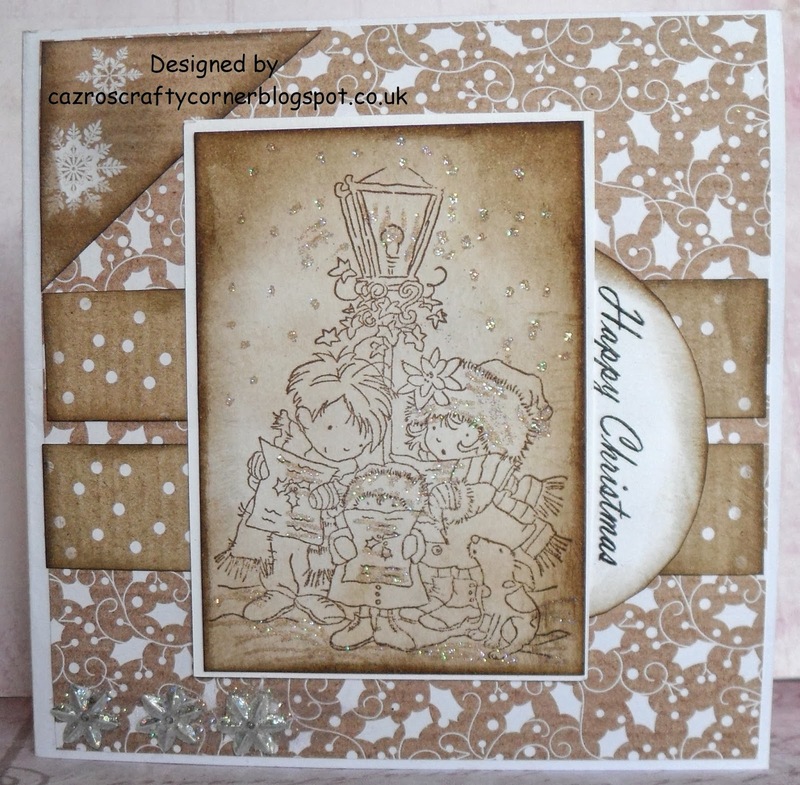 I used Brayed Burlap, Vintage Photo for the LOTV Carol singers stamp. The greeting is a stamp from my stash. Thanks ladies for a super challenge. 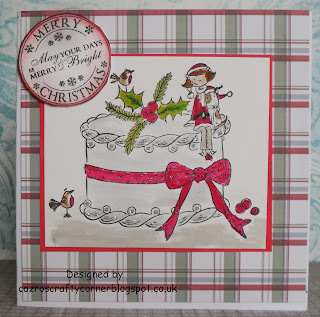 Nonni, a Blogging friend of mine has suggested I add this card into her current challenge which is here - Let's Get Inky - Stamping happy Christmas. Thanks Nonni for the nudge, hope your challenge is a success and you are well. Christmas Challenges with Sketches are looking to expand their DT. 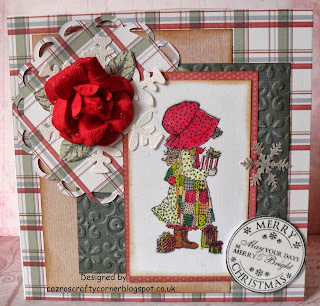 Christmas is a wonderful time of the year, by being part of an all year round DT for Christmas would thrill me, I would have the joy of extending my Christmas, I would be getting many cards made over the year instead of a rush in the latter few months. 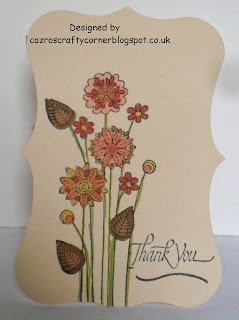 I would so enjoy being part of a Dutch blog, learning and meeting new crafters. So with my entry above, I hope the ladies will consider me for a position with their team. 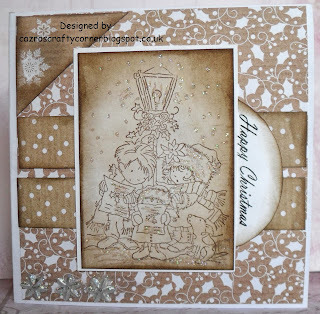 I have used papers from a Forever Friends, Christmas Kraft Pad. Greeting from LOTV, the sweet little girl is from Hollie Hobbie, free with a magazine, I coloured her with Promarkers. Sam. One of my grandsons has a birthday very soon, around the time of Halloween, a time of year he greatly enjoys. I have followed the sketch with this in mind, for it will be his birthday card. 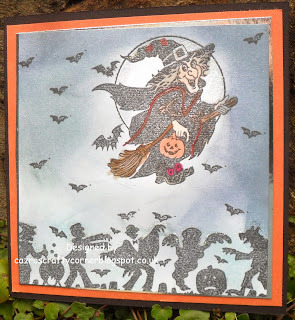 I used some scrapbook paper I bought some time ago for my "in-progress - Halloween Book" - it grows each year, then Halloween passes and I put it away for another year. (You'll find it in the Labels List). 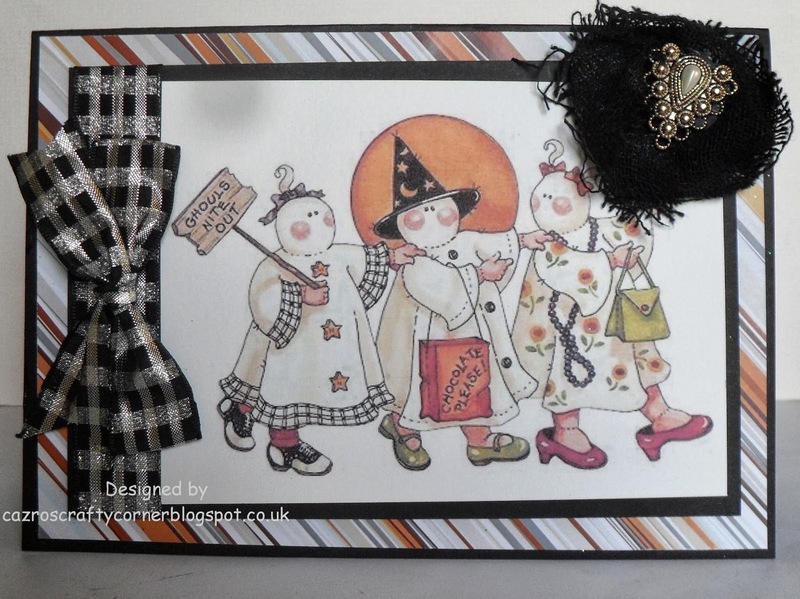 The main image is from an Indigo Blu set called Hocus Pocus, coloured with Promarkers. I wonder how many of you are thinking what is the Boo for, well I know my curious grandson will immediately get hold of the tab and lift it up, and this is what he will see. 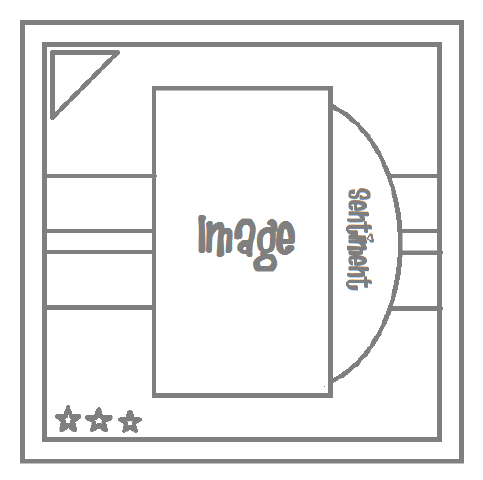 Have fun everyone with the sketch, I look forward to seeing how you have interpreted the super design. At CD Sunday Challenge - Sue T is challenging us with Fox and Friends. I have taken my twisted pyramage main image from Creative Crafting World - Pollyanna Pickering - British Wildlife - what an amazing artist this lady is, and what a pleasure to be able to use her art in paper crafting. 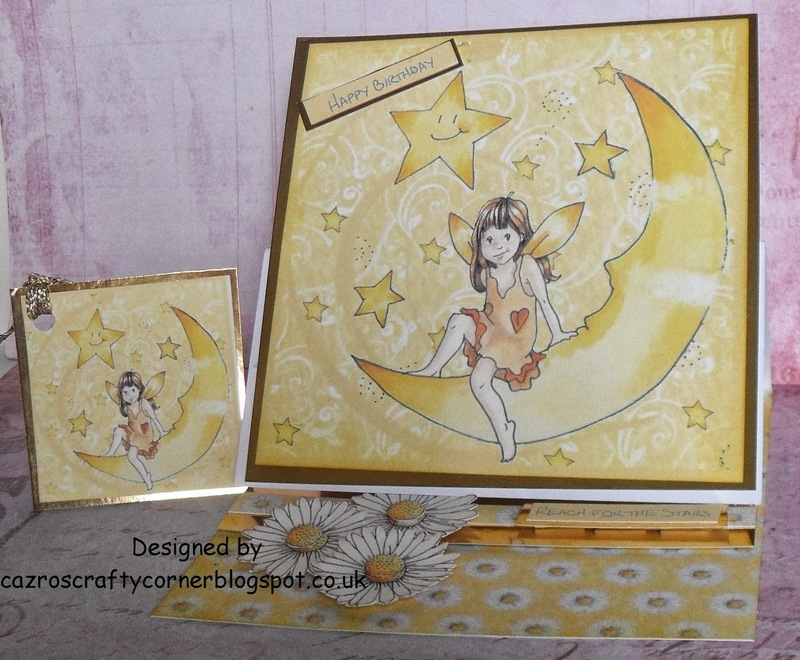 I used a Kraft card, the background is a sheet printed from The 1950s CD from Krafty hands. I added a piece of brown ribbon and a few brown card candy, with a stamped greeting. I am so looking forward to visiting you to see your projects with Foxes and Friends. 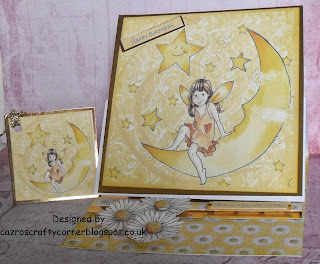 I just love the challenge this week on Creative Corner Challenges, 'Let's Go Crazy'. Don't we all at times just feel like going a little mad, well, I do. As Halloween is approaching I think this is an appropriate card. I found the free image on the internet, loving the poster which says 'Ghouls Night Out'. I added some frayed material with a pretty brooch attached and some black and white sparkly gingham ribbon. Thanks girls a great challenge. I was delighted to be accepted as part of the Sparkles Forum Challenges Design Team, a wonderful monthly challenge blog. 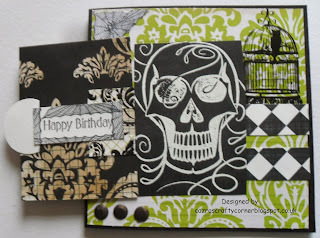 The project for October is either Halloween or a colour challenge - to use Purple, Orange and Black. I have always loved Halloween, though it is now even more enjoyable, I know it's a commercial way of extracting more money from us, but inside I'm still a girl wanting to have fun, I enjoy all the ghouls, ghosts, witches and vampires stuff. Having 6 grandchildren has given me so much fun in so many ways. I made an octagonal easel card. 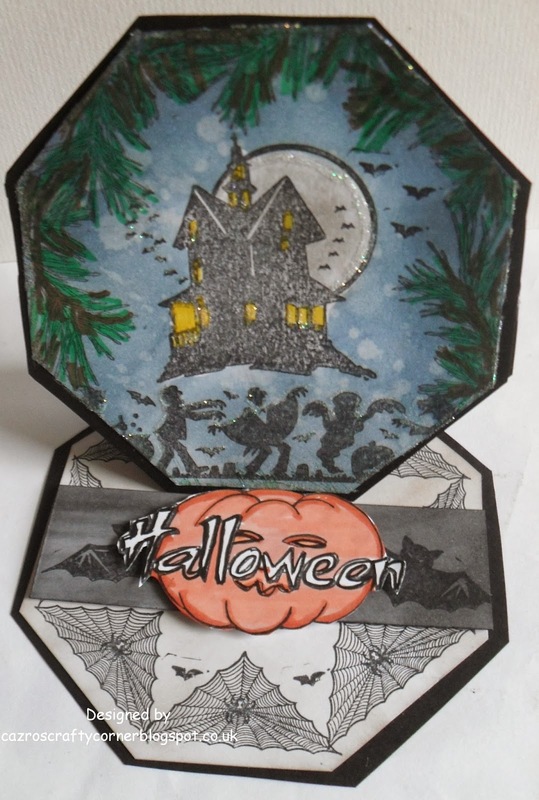 Used Distress inks to colour the front, stamped branches, the house and ghouls. Splattered water for atmosphere. Glitter touches here and there. Spider's webs, no spiders for those who may have a phobia, bats, and a large pumpkin. All of the stamps, except the branch were from Tandastamps, sadly no longer in business. 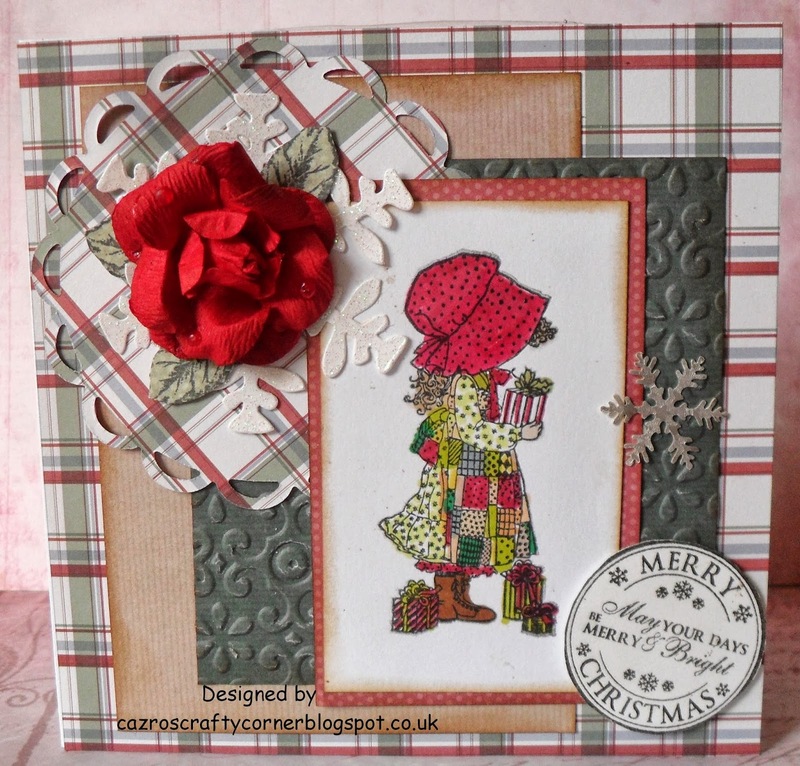 The branch is from Sheena Douglas - Pinescape stamps. I am so looking forward to visiting you to see your projects during October - November, have fun everyone. For those who do enjoy Halloween I'm hoping you all have a super spooky time. 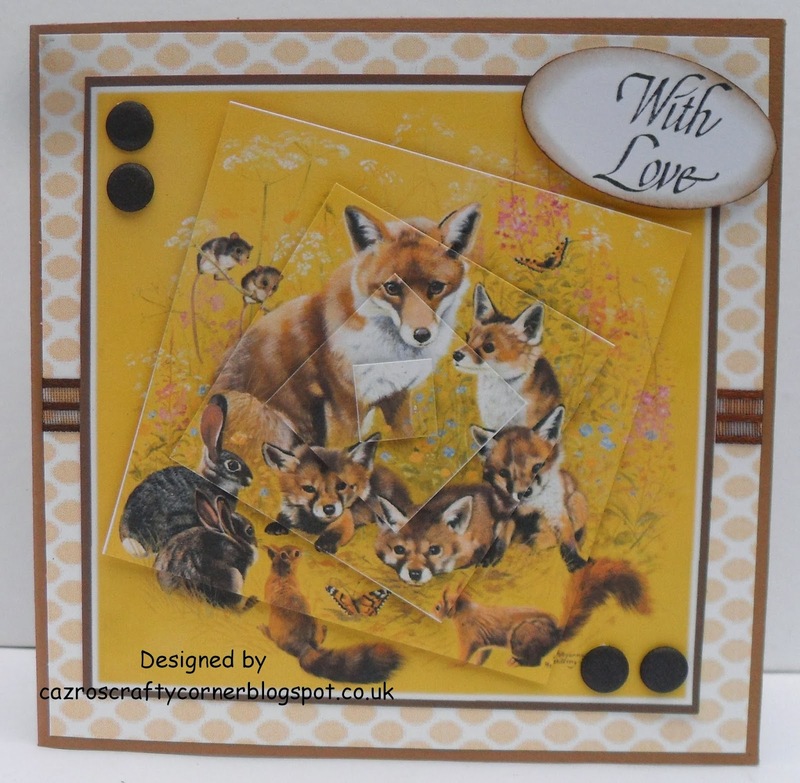 This week at Fat-Tastic Tuesday - where it is "Hip to be Square " 4 inches square to be exact - I was asked to choose the topic , I know it's not original but I do love the colours of Autumn, anything goes as long as you colour with Autumnal Colours. I first tore a piece of paper and masked over the centre of the card. I coloured my 4 " card using distress inks, then brushed over with mica powders. 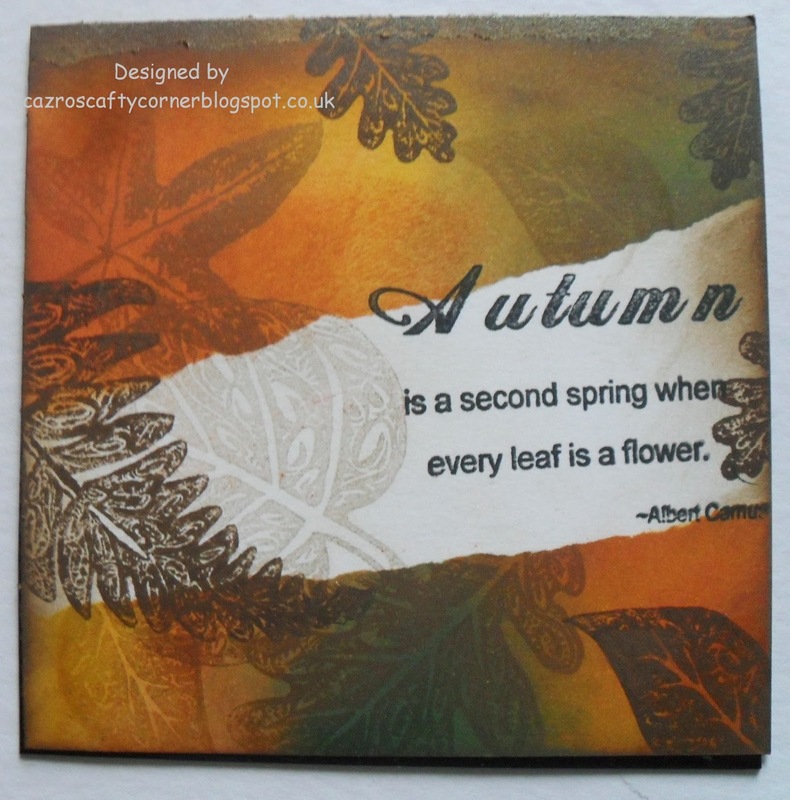 Used different leaf stamps, using Versamark, stamped over the mica powder which lifted some off leaving an impression. 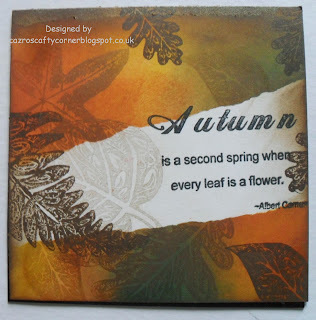 I again stamped leaves with Versamark, immediately adding another colour of mica powder. I then removed the paper, and using Walnut Stain I stamped the quotation and a few more leaves. 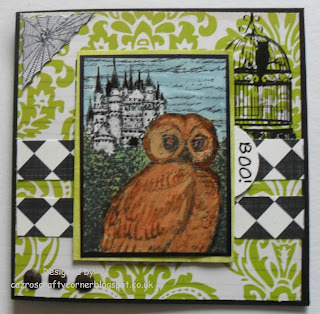 I so enjoy playing with techniques and find experimenting with them on 4 inch square card rewarding. I write the technique on the back and store them for reference in my fat- book. Looking froward to visiting you next week, don't be afraid to experiment it can be fun, a learning experience and a pleasure. This week at CD Sunday Challenges Wendy has chosen Butterflies for our challenge. Most people love butterflies, well except for my husband, nice to look at but from a distance. We once went to a butterfly farm, a new experience for us both, as soon as we walked into the area, the butterflies were flying around so freely, beautiful specimens and my hubby was off like a rocket exiting through the entrance. I had to go all the way through on my own to get to the other end to find out what was wrong, he had discovered he has a phobia of wings fluttering around his head. Sorry, I digress, back to business. Butterflies are popular with crafter's so we should be having a busy week ahead, lots of CDs out there with butterflies. 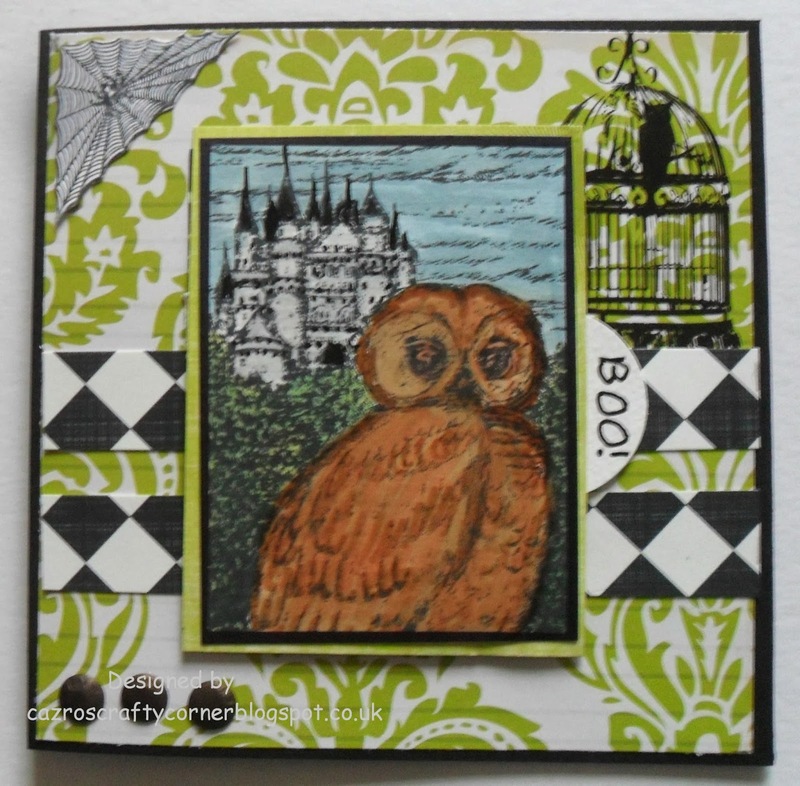 I decided to use my new Tangletastic CD of Zentangles from Sarah Hallum of Peerless Designs. If you click on the picture to see it enlarged you will see more closely the wonderful doodle art she has created on the butterflies. I made an easel card, with a slight difference. I adhered the butterfly onto a piece of black card but cut around the upper part of the butterfly to give the appearance of it being in mid air. The other two butterflies are from the background paper, adhered onto card. 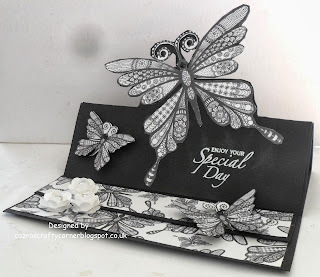 The greeting was embossed with white extra fine embossing powder, the greeting stamp is from Hobby Art. Have fun with your challenge this week everyone. For the next two weeks at Alphabet Challenge we would like to see a project with R for Roses, chosen by Shaz. Now there won't so many last week who ventured into Quilts, but we are expecting a deluge with Roses for aren't these a very popular flower. 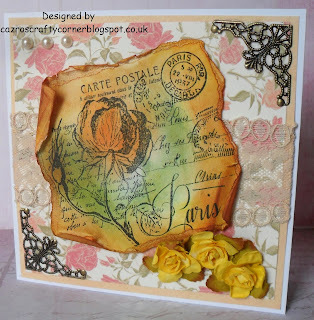 I chose to use a new stamp from Inkylicious called French rose, I started off delicate then went mad with the Distress inks, well I do like a bit of grungy now and again. I used plain background card , designer paper from a Boho Chic pad, pearls, two metal corner embellishments and three yellow paper roses. Have fun everyone, I'll be visiting you over the next two weeks. This week at Fat-Tastic Tuesday we are setting you the challenge of creating a 4 x 4 inches project for Anything Goes with Gems. 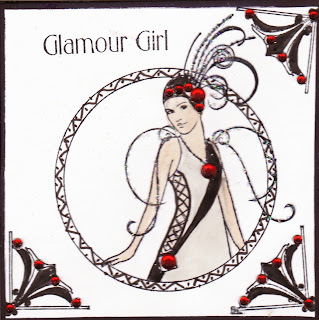 I chose an art Deco lady from Debbie Moore stamps, combining art Deco corner stamps, a little Zentangle around the circle and of course some glitter and red gems. I look forward to see how you add your gems to your designs over the next week. I have made a Fat Page for my Book, but you can make any 4 inch square project you wish. An important requirement is to please have fun. At Sunday Stamp and Sketch this week Anne-Marie has designed Sketch #177 for us, please pop over to the blog to see how the remainder of the DT have developed her sketch. 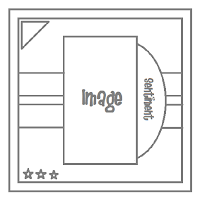 Remember it can be any orientation you choose as long as the sketch is recognisable. I matted an embossed piece of sandpapered Core'dinations onto pink card, added a triangle of design paper with roses and leaves. My main stamped image is an Inlylicious stamp, - French Rose - which I coloured with Distress inks, added some gold mix Frantage on the edges and on the main image. 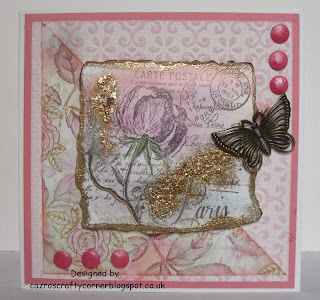 Embellishments added are a metal butterfly and Card Candy. I am looking forward to commenting on your entries, this is only my second time as a member of the Design Team so I am hoping you will enjoy my inspirational cards. CAS on Sunday have challenged us to Shape It Up, in other words, to make a shaped card, bearing in mind they are a Clean and Simple blog. I have used a Kanban stamp of fantasy flowers, coloured them in autumnal Promarkers. A long time ago, I bought loads of these die cut shapes with the plan of making a book, I have made several and still have lots of shapes left, they are the perfect size for notelets and small cards. Labels: CAS, CAS on Sunday, Thank You Card. Hi everyone, this week at Fat Tastic Tuesday Challenges, where it is Hip To Be Square - our challenge is FLOWERS. You can use any medium, any technique, anything goes as long as you combine FLOWERS. 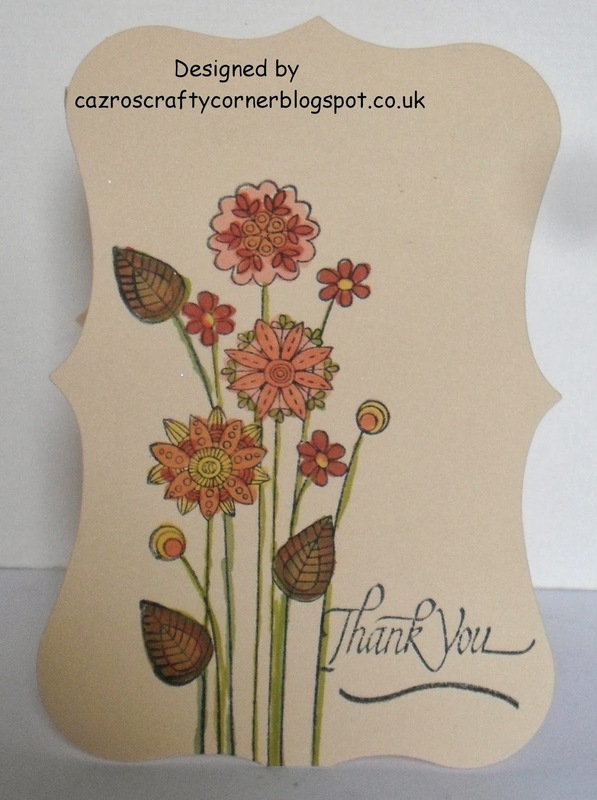 Now I am sure we all love flowers, they say they are the most popular images on cards. I have used a Joanne Sheen stamp designed by Jane Shasky called Sweet Memories. 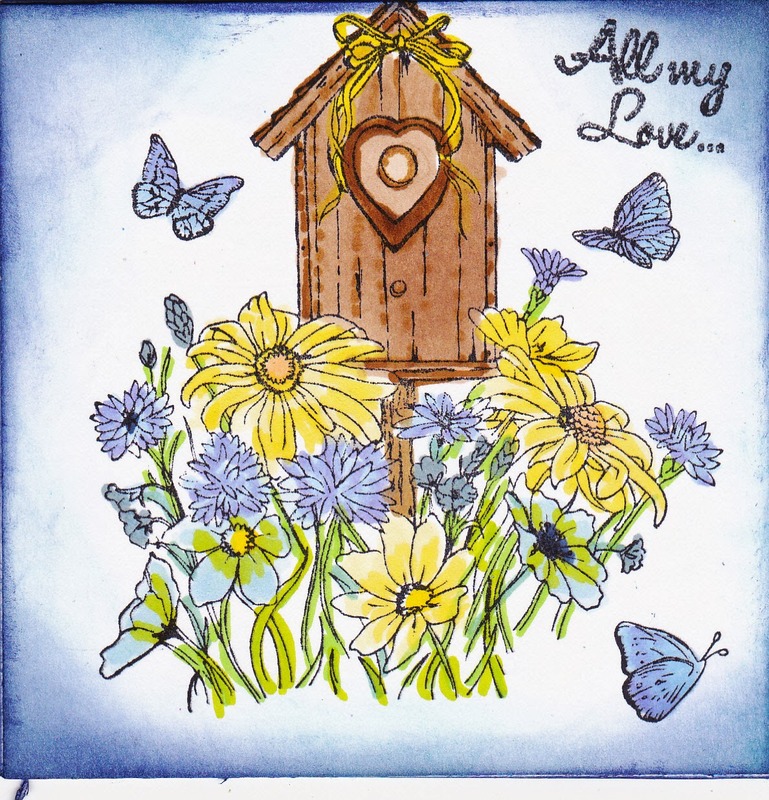 I used Promarkers to colour the stamped image and Distress inks to colour the edges. The small 'All My Love' is from a free set of clear stamps with a magazine.